gambar modifikasi motor: GAMBAR MODIFIKASI YAMAHA SCORPIO..EXTREME.!! View the robot does not always rigid. 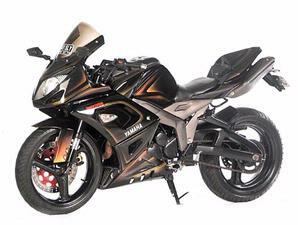 The proof, as embodied to have a Yamaha Scorpio Kabutho Eko, it looks more sangar and muscular. "The concept was taken from a robot, knowing the owner was crazy with the world like that," said Topo Goedhel Custom Atmodjo from a trusted Tauco modify it.For Topo certainly not a difficult thing to change the display to be like Yamaha's sports. 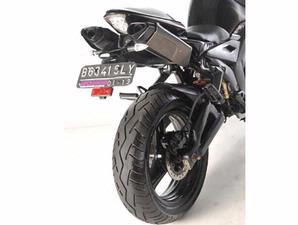 Because he admitted, in the form of enggak found many difficulties, especially the owners want to put your fairing.Spirit or the aura of this motor refers to the streetfighter. "This was, after modif the second project, it had thought to continue the flow of streetfighter. But as to fulfill the dream of Eko had, I created a completely new model," Topo said proudly.Topo contrived work can be said to run from the concept of motor sport generally. That combination bisaa seen from the front, the stern tanks until the model. For example, as the robot face, then looked ahead to be truly addressed.Headlamp is selected eye diibartakan belo model. So that added look bigger, then the above plus a kind of visor.